No words to describe him! Juventus signed Cristiano Ronaldo from Real Madrid to complete their dream of winning the UEFA Champions League. The Old lady had come inches close to European glory but it was not meant to be. 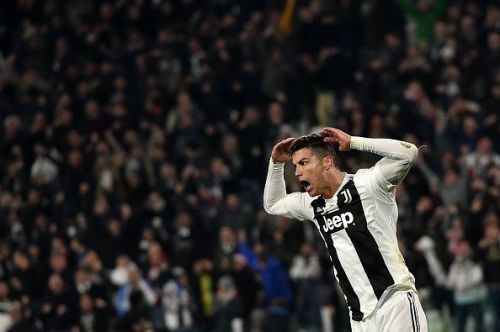 Even with Ronaldo by their side Juventus' dream looked like a distant reality this season as they went 2-0 down in the first leg of the Round of 16 at Wanda Metropolitano. The tie looked sealed and all odds favoured Atletico Madrid but Juventus never stopped believing. Ronaldo kept his faith and wanted to avenge the loss. According to reports, he had been repeatedly telling his close family and friends that Juventus will progress and that he'll score a hat-trick. Massimiliano Allegri and Chiellini believed Ronaldo could lead them to glory and surely he did not disappoint. The former Madrid ace came into this game with only one goal to his name in six appearances but a hat-trick tonight means he is just gearing up for the latter stages. The Portuguese write his own script and he just showcased tonight why he is the undisputed king of the UEFA Champions League. One can never write him off on nights like these. Ronaldo single-handedly turned the tie in favour of the Italian giants with an extraordinary hat-trick. The five-time Ballon d'Or winner beat Jan Oblak thrice at the Allianz Stadium to ensure that Juventus secure a berth in the last eight of the UCL. He headed his first past Oblak in the 27th-minute mark after a beautiful cross by Bernadeschi and his second came early on in the second half as it needed some help from the goal-line technology. After levelling the scores on aggregate, the attacker was hungry for more. He rose to the occasion as he dispatched a penalty late on in the game to take it away from the Rojiblancos as Juventus came back from the jaws of death to qualify for the quarterfinals. Ronaldo was the only difference between the two sides as he put in an exhilarating performance and silenced his critics who had a lot to say after the first leg in Madrid. This is not the first time Ronaldo has overturned a tie all by himself. He stole the show against Wolfsburg as well after a brilliant hat-trick at the Bernabeu saw Madrid advance to the semis 3-2 on aggregate. The 5-time Ballon d'Or winner has Juventus dreaming again. He has instilled new energy and winning mentality into this side. With Ronaldo rallying with the troops of the Bianconeri, they are serious contenders for lifting the title this season. Nights like that prove that one should never write Cristiano off as he always rises to the occasion. This is why Juventus broke the bank for him. Ronaldo has done it again - cometh the hour, cometh the man!.